Insights Success made its selections for this list by identifying companies that are driving change in their respective industries through their unique products and services. “Truly disruptive innovations have the potential to reinvent the very basics of their respective industries,” claims the Insights Success article. Xeeva is doing just that in the procurement space with its AI-driven procurement and sourcing software that improves the source-to-pay process. 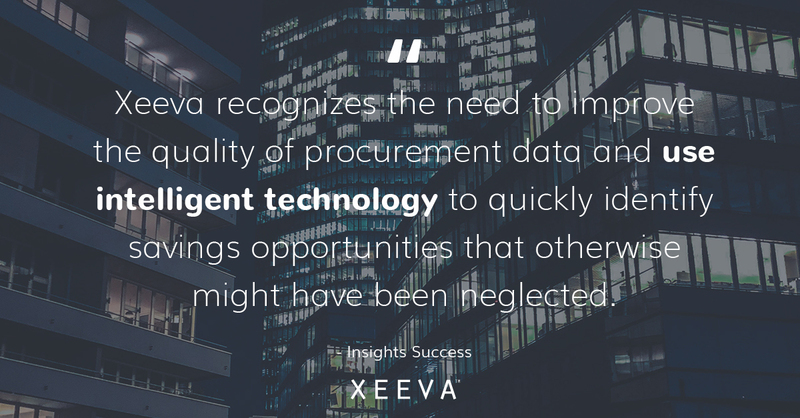 Insights Success’ profile describes Xeeva as “an organization on a mission to redefine the procurement software industry,” which it’s achieving through the use of its AI tech. The traditional procurement process can be time-consuming and complicated, but Xeeva is changing that with Xeebot, the patented artificial intelligence that powers its software. “Through patented AI technology and a full suite software offering,” the article explains, Xeeva is “able to simplify the source-to-settle process and drive massive savings” for its customers. The article continues, “Xeeva recognizes the need to improve the quality of procurement data and use intelligent technology to quickly identify savings opportunities that otherwise might have been neglected.” Xeebot does this by taking a company’s unstructured, disorganized spend data and cleansing and categorizing it down to the line level, which provides detailed visibility into savings opportunities. Xeebot also converts strategic sourcing initiatives into usable catalog items, ensuring customers are getting the best deals from Xeeva’s suppliers. Read Insights Success’ full profile about how Xeeva is disrupting the procurement space with AI here.